Earlier this year I cycled to Paris. I did a similar trip last year, and I thought I would like to repeat the experience hopefully this time without the hitches. I would love to do the full monty right from Central London by bike, riding all the way to the Ferry terminal at Newhaven. However, time constraints and annual leave from work meant that my cycling didn't actually start until I reached French soil. So strictly speaking I did a Dieppe to Paris trip! On the way to Dieppe again! I boarded the 10pm ferry from Newhaven, and arrived in Dieppe at around 4.30am. By the time I had rolled off the ferry and gone through passport control it was almost 5.30am. That was handy for me because I hadn't booked any accommodation in Dieppe, figuring that at that time of the morning it would be feasible to start cycling immediately. However, it was late August, the roads were still dark and I was slightly apprehensive about how tricky it may be along the unlit Avenue Verte. Furthermore, this rail trail, being in bowl, meant that there may be a hanging mist. The prospect of riding through the woods in these conditions didn't really excite me. So for me, it was handy to just saunter through Dieppe up to the start of the trail in Arques la Bataille. Helpfully, by the time I got there the sun was just breaking through, so it wasn't pitch dark. I was looking forward to the sun coming up completely in a hope that I might a bit warm as well. Because this part of the Avenue Verte colllects morning dew and dampness it tends to be a few degrees colder than the immediate surrounding areas. In any case, it was cold and I had dressed for the occasion by wearing two waterproofs on top of my cycle jersey, as well as a high vis gilet. It sounds like overkill, but I needed it! It was lovely and peaceful riding through this part of France with no one else around, and just the trees and the birds for company, and the odd car passing by on the adjacent D1 minor road. I always like that early bird feeling where you get to see the daybreak before anyone else. As it happened I wasn't the only person cycling along the disused railway line. A group of four or five riders who had been on the same ferry as me also took the Avenue, though I am not sure whether they were going all the way to Paris, or if they were just looking for a nice night ride in Normandy. They weren't carrying much luggage and they were just on hybrid bikes, so I can't imagine they could have been going that far. In fact when I saw them they were already having a snack stop and we were less than 10 miles into the ride! As the time drew to around 7 o'clock I saw a number of riders going in the opposite direction, and they were mainly French. I am guessing there must have been a 8am or 9am ferry due to leave for the UK. So it seems that this ride is as popular with Londoners wanting to go to Paris as it is with Parisians wanting to come to London. Next, a few other people who passed me slowed down to ride along for a short while. They were a couple that looked quite fit, and it looked like they were riding with a mission as they were hoping to get to the suburbs of Paris by the end of the day, and they were hardly carrying any gear on them. So along the Avenue Verte to Paris it seems you can meet a variety of cyclists out on a bike ride, and at a variety of times too. Avenue Verte was a nice as ever once the sun came up, and was lovely and peaceful. At this time of the morning, rush hour, there weren't loads of cyclists on the trail, and in fact there were quite a few vehicles on the various roads that crossed the cycle path. I took an initial breakfast stop at Neufchatel-en-Bray along the path, where there were benches near a pretty church, and toilets further along the way. There were also residential houses that backed onto the path, and I noted an old woman who didn't seem too impressed to open her curtains and come face to face with my mug! I bid her good day, and the old hag scowled back! Once the traffic free path ended at Serqueux I stuck as much as possible to the waymarked signs for Avenue Verte up to Forge-les-Eaux. This meant I did quite a pleasant run-in to the village via some quiet residential streets and through some parkland. Forge-les-Eaux was another stopping point to stock up on food and have more breakfast. I had considered stopping by and saying hello to the guy in the local bike shop where I spent a fair bit of time and money on inner tubes last year. That bike shop had been a godsend. It wasn't open at the time that I passed through, so I pressed on with the next phase of my ride. For my part I had set out to complete the ride over two days, in a change from last year (and even previous years). So my destination was just going to be Beauvais, a place I passed through very briefly last year. It was the scene of a mad dash to get the last train to Paris in an attempt to avoid being stranded in deepest Normandy after dark! Like last year, I was riding a Raleigh Mustang gravel bike and carrying panniers. But this time, rather than being on the Mustang Sport, I was testing the upgraded version, a Mustang Comp. This bike comes complete with hydraulic disc brakes and just a single chain ring, complemented with dinner plate sprockets to get me up any hills. The Comp is less weight than the sport, even with my panniers mounted on the bike . I'll take that! It is quite possible to look out for, and follow the characteristic green and white arrows all along the way and end up at Ile de la Cité opposite Notre Dame Cathedral in Central Paris. The quiet roads and traffic-free paths guarantees that you won't be riding along busy roads. After Forge-les-Eaux I chose not to follow those arrows though, and make up my own route. That part of France has so many minor ("d" and "c") roads that you can choose any of them and end up on a quiet route. On this Friday morning in August people may well have been on holiday. Otherwise they were hard at it in their offices, their farms, their homes or just shopping. Basically, they were anywhere but on the road! So I had the pick of lot in terms of which route to take, and so I eeked out my own itinerary to Beauvais. From Forge-les-Eaux the road dropped downhill into the area known as Pays de Bray, where lots of towns called "something or other -en Bray" seemed to pepper the landscape. I don't know what Bray means, but I guess it must be something like "lumpy roads and steep lanes" based on the terrain! Hills aside, the landscape is pictureseque with undulating farmers fields and very old villages. Of particular note were the villages of Songeons, Buicourt, and Gerberoy. 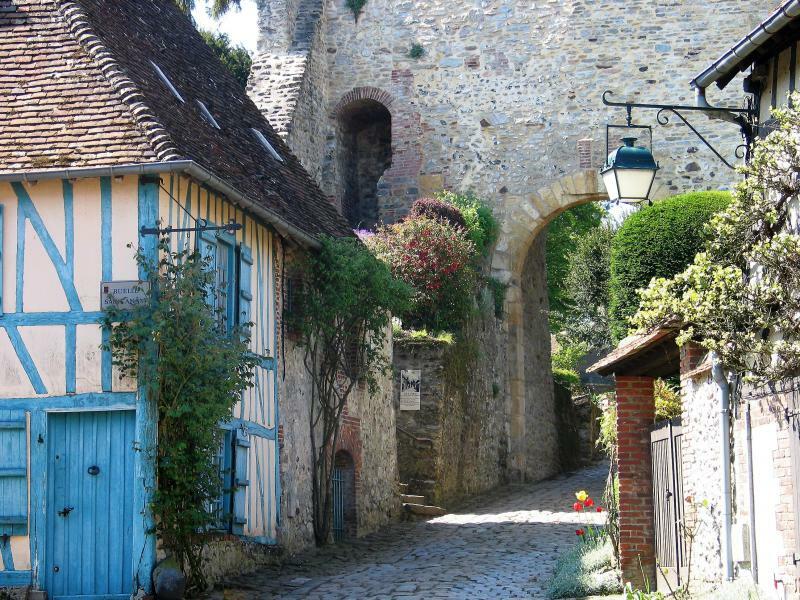 Apparently Gerberoy is billed as one of the prettiest villages in France. It's certainly a nice place to be, but I wouldn't want to square up to the Mayor of Giverny or one of the many villages in Dordogne and say that! The weather was very pleasant and sunny, but somewhere I had seen a weather forecast for rain at Beauvais right at the moment I was due to reach the town. So although I was enjoying my ride, I had a nagging thought that sooner or later the sun would turn dark and I would get drenched as the heavens the opened. Although I was equipped with wet weather gear, I didn't relish the prospect of having to bounce around through puddles and not be able to see the nice view through the dampness. I just had to comfort my self in the fact that my journey would soon come to an end as I was only going as far as Beauvais. In fact, my ride ended up being rain free. I was even lucky because on the approach to Beauvais the roads were wet like there had just been shower. So France Meteo hadn't been wrong, it was just that I had timed my ride into Beauvais perfectly! Once in this town with its medieval buildings and cathedral I celebrated with an extra large swig of water and and a Clif Bar (that was all I had left!) before tackling the climb to get up to my hotel in the outskirts of the town. It had been a pretty ride, with a few famous landmarks along the way. But after having had just two hours' sleep, I was ready to crash out in my hotel room. My Strava route from Dieppe to Beauvais can be found here.